Our e-newsletter is published twice monthly and includes upcoming events and news about Virginia Humanities and our programs. Sign up now to be sure you don’t miss announcements of future events around the state. 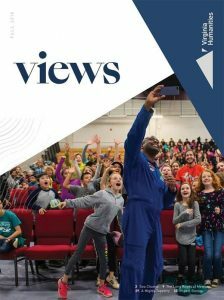 Views is our print publication, published once a year. Want a copy of this publication mailed to you? Sign up for our mailing list with the form on this page. Would you like to receive our annual print newsletter "Views"? Would you like us to mail you a copy of the most recent Views?